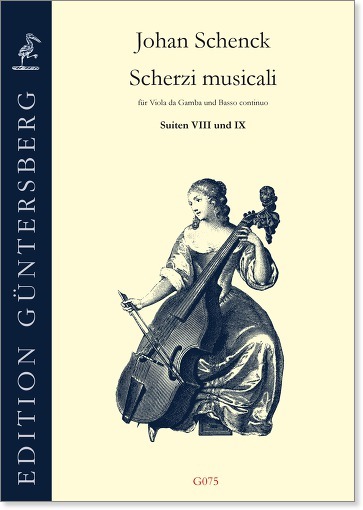 The Dutch viola da gamba virtuoso and composer Johan Schenck is wellknown to all gamba players. His voluminous opus Scherzi musicali was published 1698 by Roger in Amsterdam. It makes full use of the bass viol’s range and chord possibilities. Our practical edition follows the original musical text as far as possible, but it offers - compared to the original - a view of both parts in score form, a better legibility, and a separate, completely worked out score containing the realization of the figured bass, since the original figuring is at times incomplete and the intended placement of the figures often unclear. Our edition is divided into seven individual volumes. Under the topic "Continuo realisation for Johan Schenck: Important addition, necessary evel, unnessary interference? Eperiences during the work at the Scherzi musicali" Dankwart von Zadow has given a talk on the 19.12.2005 at the " 2. Babelsberger Gambentreffen", the text of which you can download here. Sorry, it is available in German only.download the text.